Adam Foulds’ novel The Quickening Maze was a surprise amongst the shortlist of 2009’s Man Booker Prize. The book revolves around real events in Epping Forest in 1840, which Foulds has managed to combine cleverly with his own imaginings. Described as a ‘lyrical novel’, the story centres on the poet John Clare who is coming to the end of his career with his poetry now considered not to be ‘in fashion’. As an inpatient at High Beach Private Asylum we see Clare alongside other patients early in the book, such as the religiously fanatic Margaret, and in these surroundings Clare appears comparatively sane. The Asylum owner is Dr Matthew Allen, another factual character who, with his sermons and asylum-revolved lifestyle, appears dedicated to his patients. It is also apparent that he is able to develop a trusting bond with his patients and he encourages Clare to continue pursuit of his poetry career.Alfred Tennyson is the third historical figure introduced to the tale as an old friend of Dr Allen’s seeking a cure for his brother’s melancholy. Throughout the book Tennyson appears the most mysterious character with only snippets of unfinished poems and his feelings towards his brother giving any indication as to his nature. The biggest example of this is how the book is split into seasons rather than chapters. As time passes Clare’s condition appears to worsen and he becomes hallucinogenic to the point he mistakes his own identity, first believing himself to be John Randall the Boxer and then Lord Byron. The sadness of this is not realised until Clare witnesses the abuse of a fellow patient but it is evident that, in his fractured state of mind, no one will believe his claim. It is not only the patients that deteriorate with time, Dr Matthew Allen also unwinds as his inventive scheme for furniture manufacture fails. This not only means his own financial ruin but has an impact on Alfred Tennyson and his family who have all invested in the project. It is a depressive outcome but also the unmasking of Allen as his attention is taken from the patients, he outwardly cared so much for, and into his own vain money-making pursuits. Foulds with this book has successfully combined many difficult elements. He tells a story of factual events and characters whilst adding to them with his own fiction and he does this so seamlessly that, unless the reader is familiar with the history of the figures, the fiction and fact cannot be separated. He also uses language and description to emphasise what appear to be the two overwhelming themes of the book: nature and poetry. Both nature and poetry appear entwined, with Clare’s confinement at the asylum, and thus distance from nature, being the downfall of him. With so much dramatic symbolism successfully portrayed in one book it is not difficult to see why The Quickening Maze was shortlisted for such a prestigious prize. 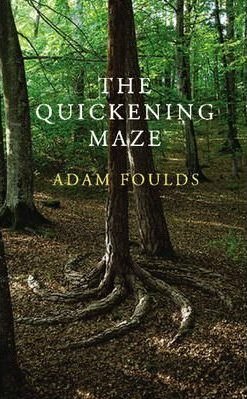 The Quickening Maze by Adam Foulds is published by Jonathan Cape Ltd (£12.99) and is available to buy from Amazon. This entry was posted in Reviews and tagged Adam Foulds, Book reviews, The Quickening Maze by Judy. Bookmark the permalink.